Verbena is alovely garden plant. It has strong square stems with grey leaves and spikes ofpurple/violet flower heads all the way through the summer from June toOctober. It grows to a height of 100 –150cm and looks great in a country garden, wild flower garden or middle of aborder. These plants will attractbutterflies into your garden. They aregood for including in flower arrangements. 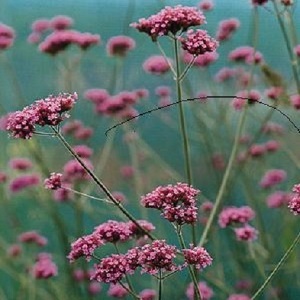 Verbena prefersfull sun and moist, well composted and well drained soil. Plants self-seed in the right conditions. 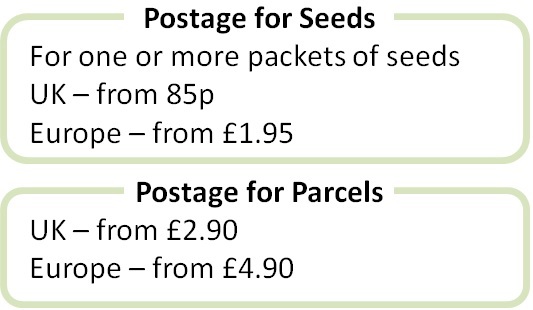 Pack of 50 Tuned Seeds. These are TunedSeeds and do not need pre-chilling (normally needed for this species). Plants from winter/springsowings flower in the first year. Sowing instructions and a colour photo areprinted on the packet. Sow These are Tuned Seeds and do not needpre-chilling (normally needed for this species). Sow the seeds in moist seed compost, andcover lightly with compost or vermiculite. Keep at 16 – 18°C and germination takes 2-4 weeks. Transfer seedlings to pots when big enough tohandle. Harden off seedlings beforeplanting out.